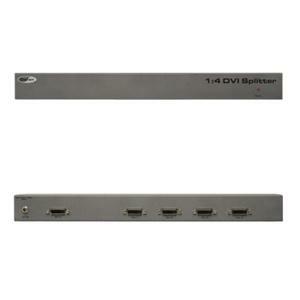 DVI (Digital Visual Interface) is a common connector used throughout the industry to connect digital video displays to video sources such as computers. Gefen's 1:4 DVI Distribution is a distribution hub that sends the same DVI graphics source to up to four DVI digital displays (flat panels or projectors). It is a reliable solution that accommodates four digital video displays at the same time, creating a multi-viewing environment that maintains the highest resolution video at all times.